Heat oil in a skillet over medium-high heat. Cook pork chops in oil until both sides are browned. Meanwhile, prepare stuffing according to package directions. Pour pie filling into a lightly greased 13″x9″ baking pan; lay pork chops on top. Bake, uncovered, at 325 degrees for 45 minutes to one hour, until pork chops are cooked through. Serves 8. Cut chicken breasts into 1-inch cubes. Cut each bacon slice into thirds. 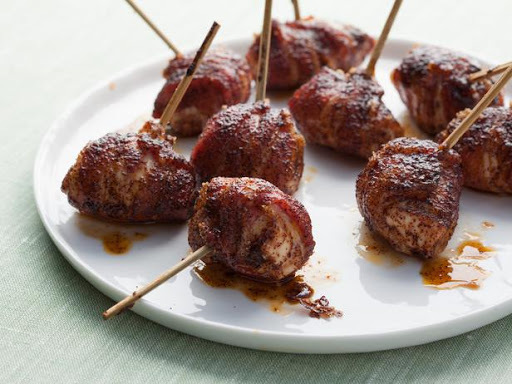 Wrap each chicken cube with bacon and secure with a wooden pick. Stir together brown sugar and chili powder. Dredge wrapped chicken in mixture. Coat a rack and broiler pan with nonstick cooking spray. Place chicken wrap on rack in broiler pan. Bake 350 for 30 to 35 minutes or until bacon is crisp. 1. Soak wood chips in water 30 minutes. Prepare smoker according to manufacturer’s directions, bringing internal temperature to 225° to 250°; maintain temperature for 15 to 20 minutes. 2. Rinse and pat ribs dry. If desired, remove thin membrane from back of ribs by slicing into it with a knife and then pulling it off. (This will make ribs more tender.) Coat both sides of ribs with liquid smoke and olive oil. Sprinkle ribs with Dry Rub, and rub into ribs. 3. Drain mesquite wood chips, and place on coals. Place pork ribs on lower cooking grate; cover with smoker lid. 4. Smoke ribs, maintaining temperature inside smoker between 225° and 250°, for 3 to 4 hours or until tender. Hands-on time: 5 min. ; Total time: 5 min. When grinding the spices it is best to use a mortar and pestle or a small spice grinder. The rub produced by a food processor is too coarse. Combine dried rosemary, dried thyme, kosher salt, and white peppercorns in a mortar bowl or spice grinder; grind using a pestle or grinder until herbs and pepper become a medium-fine powder. Store in an airtight container in a cool, dark place up to 6 months. Puree the balsamic vinegar, garlic, and thyme in a blender until mixed. With the blender running, slowly pour in the olive oil until thickened and incorporated. Pour the marinade into a resealable plastic bag. Add the pork pieces, coat with the marinade, squeeze out excess air, and seal the bag. Marinate in the refrigerator for 30 minutes. Preheat an outdoor grill for medium heat, and lightly oil the grate. Remove the pork from the marinade, and shake off excess. Discard the remaining marinade. Cook the pork on the preheated grill until no longer pink in the center, about 10 minutes. An instant-read thermometer inserted into the center should read 160 degrees F (70 degrees C). Once cooked, remove from the grill, cover with aluminum foil, and allow to rest for 5 to 10 minutes before slicing. While the pork is cooking, melt the butter in a saucepan over medium heat. Stir in the brown sugar until it begins to simmer. Add the apples, cherries, ginger, cinnamon, and nutmeg. Cook and stir until the apple is tender, about 5 minutes. 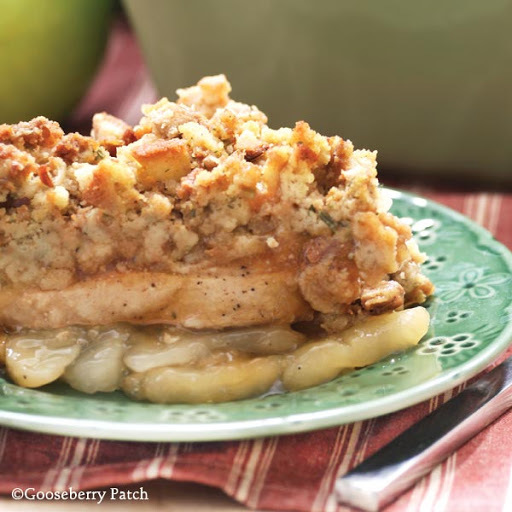 Serve the sliced pork topped with the apple compote. Slow-Cooker Chicken and Vegetable "Stir-Fry"